Performers include: Rosie Cavaliero, John Simm, Phillip Glenister, Benedict Wong, Adrian Edmondson, Nathan Stewart-Jarrett, Ralph Ineson, Myanna Buring, Anastasia Hille, and Craig Parkinson. 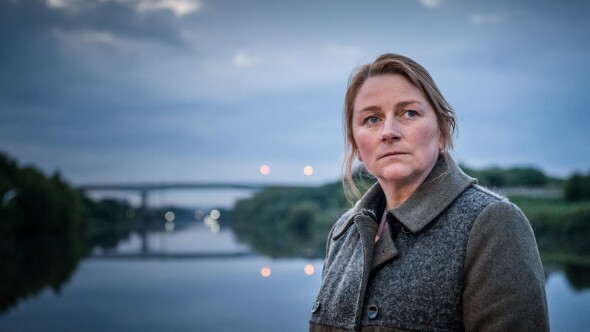 This crime series revolves around different cases with no-nonsense, hard-working DS Susan Reinhardt (Rosie Cavalieroz) as a recurring character. The first storyline follows Detective Constable Marcus Farrow (John Simm). He’s a well-liked detective who is part of the Manchester Metropolitan Police. His life falls apart when he finds his wife murdered. Discovered at the scene of the crime, all of the evidence points to him. Marcus escapes and goes underground in the streets that he used to police. In the second storyline, widowed Prison Officer David Murdoch (Philip Glenister) finds his life turned upside down. On a routine visit to a Manchester hospital with an ill female prisoner Jules Hope (MyAnna Buring), he takes a phone call from someone who is holding his very pregnant daughter, Lucy (Sammy Winward), and threatens to kill her if he doesn’t do as instructed and help Jules escape. He has no alternative but to go on the run and inadvertently becomes the prey. Reinhart finally catches up with Murdoch, but he once again makes good his escape. An epic game of cat and mouse ensues as he discovers that Lucy is being held in a secret location in the Lakes. First aired: N/A (did not air in United States). What do you think? Do you like the Prey TV show? Do you think it should have ended or been renewed for a third season? They have but they changed the time. The second and third episode were pushed back to Thursday 11PM EST. Season Two is being burned off starting at 2AM EST 3/18. This one must have gotten abysmal ratings. I happened to like it a lot but BBCA has no patience for it. what I’d like to know is why they showed 1 episode and I haven’t seen any since .Wheres the rest? Tuning in to this one, too.